This is exactly what you need to burn a lot of fat and get fit quick, a Kettlebell Tabata HIIT workout. Kettlebells are a super versatile piece of equipment the exercises that can be done with Kettlebells are mostly high energy movements that require a lot of muscles to be activated at one given time making them ideal for burning lots of calories which will help you burn more fat! What’s more they are relatively cheap to purchase and can be stored at home or even transported with ease on business trips or vacation if needed. You can basically take the gym with you wherever you go. For effective weight loss we believe weighted HIIT is the way to go as it covers all of your aspects of fitness from cardio to strength and flexibility and burns the most amount of calories in the shortest time. Tabata is great form of High Intensity Interval Training that can be done in just 4 minutes with scientifically proven benefits to health and fitness. Therefore mixing Kettlebells and Tabata protocol is a recipe for success. 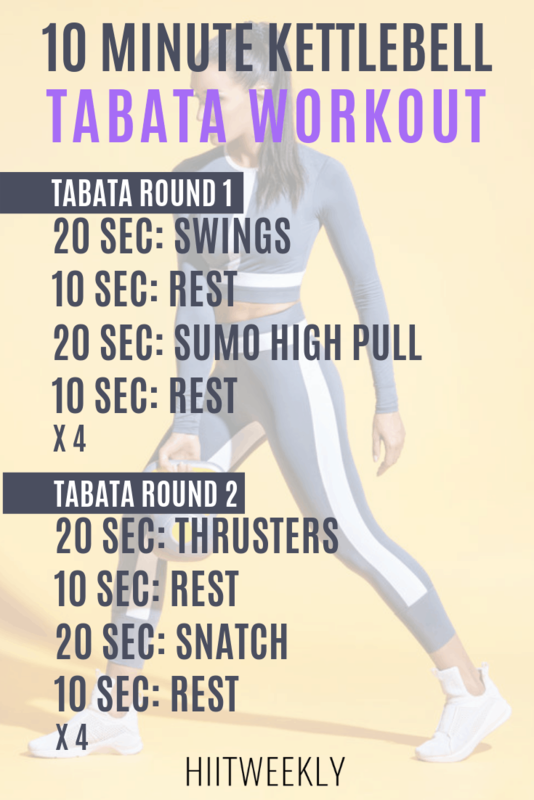 The basic principle of Tabata is that you do 8 rounds of 20 seconds of maximal exercise followed by a short 10 second break, for a total of 4 minutes. 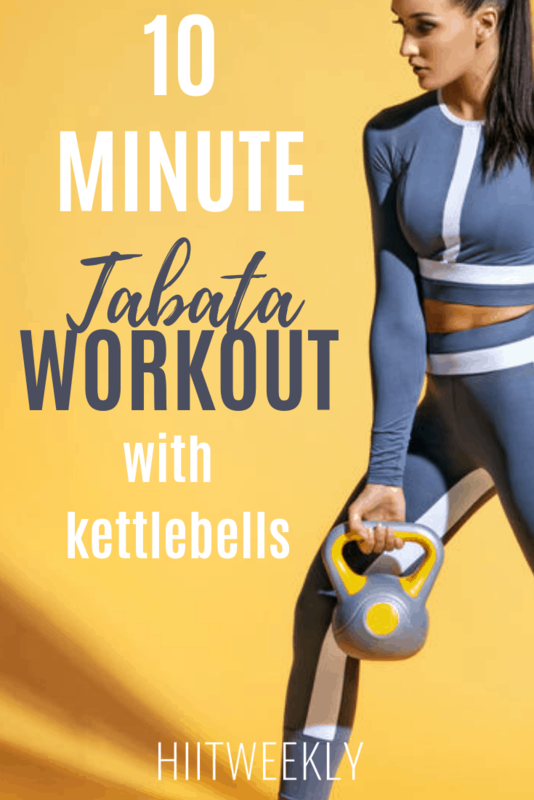 Today’s workout is 2 Tabata workouts with Kettlebells separated by 2 minutes that can be done in just 10 minutes making this a very short but effective workout that will raise your metabolism long after your workout ends in what’s termed the afterburn effect. The afterburn effect is when your body’s metabolism is raised after your workout as it recovers and repairs form the damage done during the actual workout. This damage will not be something you will know about initially, although signs will include slight muscle soreness in the days afterwards. Before you begin make sure you do a 5 minute warm up. Alternate arms with each round. 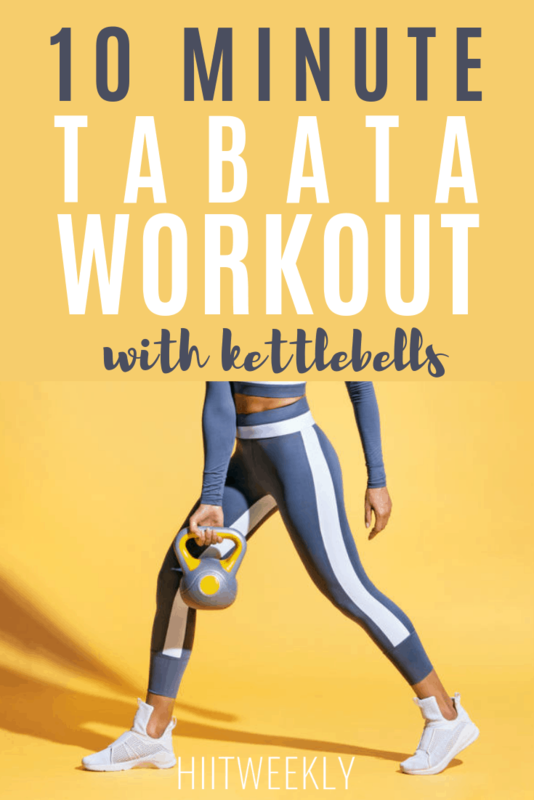 We hoped you enjoyed the workout, Remember to work as hard as you can for the 20 seconds to get the most out of this Kettlebell Tabata HIIT. Why not try our 5 minute abs here to finish off your workout. Want more Kettlebell workouts for weight loss and fitness? If you are looking for more workouts like this one then you may like Kettlebell Challenge Workouts. Its 33 Kettlebell workouts that can be done in under 20 minutes at home or on the move to help you get into amazing shape.